US Army general and US Secretary of State under President Ronald Reagan. 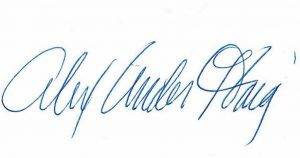 SIG – Bold blue ballpoint pen signature on a 3″x5″ card (sufficient room for matting). Accompanied by a handsome 4″x6″ color glossy reprint portrait as US Secretary of State. Haid served as White House Chief of Staff under Presidents Nixon and Ford. He also served as Vice Chief of Staff of the Army and as Supreme Allied Commander Europe (Patch Barracks, Stuttgart). After Reagan one the 1980 presidential race, he selected Haig to be secretary of state. Following the assassination attempt on the life of Reagan, Haig asserted I am in control here, later clarifying that he was functionally in control of the government.